A join condition that tests whether two nodes are the same nodes (that is, have the same identifier or have the same relative path from the nearest ancestor with an identifiers). Create a join condition that determines whether the node identified by the first selector is the same as the node identified by the second selector. 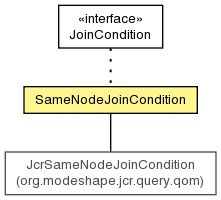 Create a join condition that determines whether the node identified by the first selector is the same as the node at the given path relative to the node identified by the second selector. Get the selector name for the first side of the join condition. Get the selector name for the second side of the join condition. Get the path for the node being used, relative to the second selector.